Although I’m the first one to admit that I love a visit to a spa for a facial, more often than not, it’s just as easy and convenient for me to try to do it myself at home. Now bliss has introduced the triple oxygen ‘facial in a box’, using three of my favorite products in the triple oxygen range. That makes this beauty girl very happy! Triple oxygen instant energizing mask, which instantly energizes and detoxifies the skin The glow starts here! Next, that’s incredi-peel (review), which is a glycolic acid peel (non-irritating, but you should always do a patch test before application) that leaves skin soft and radiant. Finally, triple oxygen ex-‘glow’sion (review), infused with vitabeads, oxygen and micro-algae. I love this moisturizer because it’s light and perfect for all skin types. And my personal recommendation, if you decide to pick up the facial in a box kit, is to also pick up the bliss triple oxygen instant energizing eye mask (review). I’m never without a box of these! 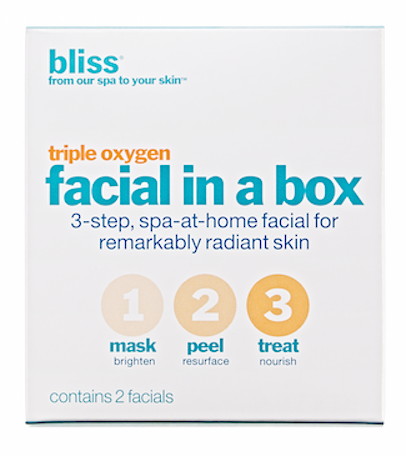 The bliss triple oxygen facial in a box ($12) is an inexpensive way to treat yourself to a DIY Spa night, as a facial treatment for when you travel, or just as an excellent way to try the bliss triple oxygen line. You can find the facial in a box at Sephora, Ulta, at bliss spas and blissworld.com. 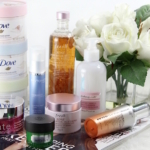 Have you tried the bliss triple oxygen product line? 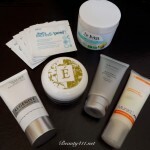 Jumpstart your skin – New masks & peels to try!